July | 2014 | Little miss obsessive's anatomy!! 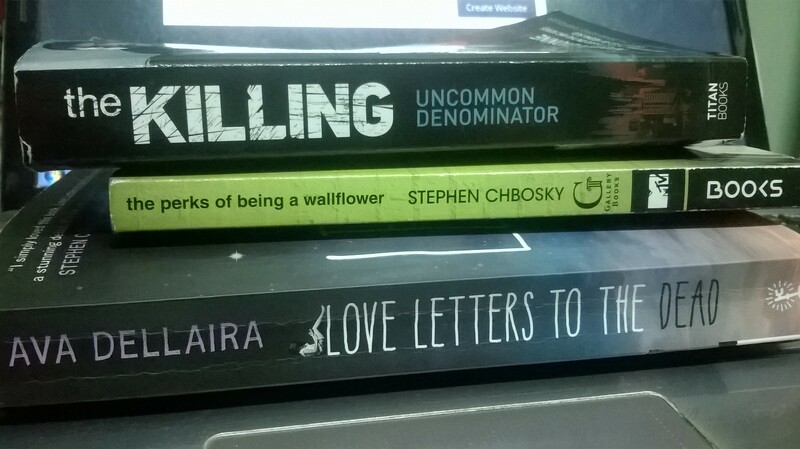 It took me sometime but i finally managed to finish “Love letters to the dead” and I’m ready for the new novel based on series “The Killing. Can’t wait. Love letters to the dead was more or like similar to “The perks of being a wallflower” but both the books have their own charm. A part of me relates to protagonists in both the books, for a moment there i couldn’t help but notice that Charlie was projection of my own self in a different way. I haven’t written letters to anyone for ages now. I used to, once. I truly was good with letters because i used to write letters to my friends, close friends. Letters with and without reasons. Funny how we grow up and everything changes because of experiences and time and life. If i was to write a letter to a dead celebrity, like Laurel did in the book, i would choose George Mallory. When i read Paths of Glory all i wanted to know was what happened to him and his partner. I mean did they make it? Did he get to put his wife’s picture up there? What happened that day? Where is Andrew Irvine? I’m nothing like George Mallory but his life fascinates me. His love for Ruth and Everest is amazing. If only i was that kind of person, with true motivation and hunger in me. If only, I was driven by a passion so deep, so true. I want to ask him, if he was scared when he fell? Did he felt lost? Cause i m scared all the time and I feel lost all the time. I wonder what Ruth must have gone through, not the part where she lost her man but the part where she didn’t even know what happened to him, did he or did he not get to make his dream come true? I’m obsessed with it, wonder if it bothered her and for how long? If only Mallory could know how his grandson followed his footstep and kept his legacy alive by reaching the Everest. For me George Mallory and Amelia Earhart are two heroes, real heroes. I’m obsessed with their mysteries. I can only hope TIGHAR would one day find her plane. We can’t bring her back or know what exactly happened, but it would be like having a closure. Wish we could answer every question with a song…!!!! Confession of a Superhero …!!!! Shania Twain sang that for me…i would like to believe that!!!!! Rain is a good place to hide tears…!!!! I feel sad like sad, sad…you know. I’m exhausted and I need weekend. I’m sleep deprived and all lost. Just one more day at Gotham and then I can die on my bed for two days. If only you could buy hugs in the stores or find them hanging on tress…if only. Honestly, I don’t even know what made me cry. Wasn’t a bad day. Nothing happened. Guess I need sleep. Real bad. Best part of my day…!!!! Cinnamon donut, my new friend…!!! !